Over the years, LG innovative high-end devices never fail to surprise us with their unique design. 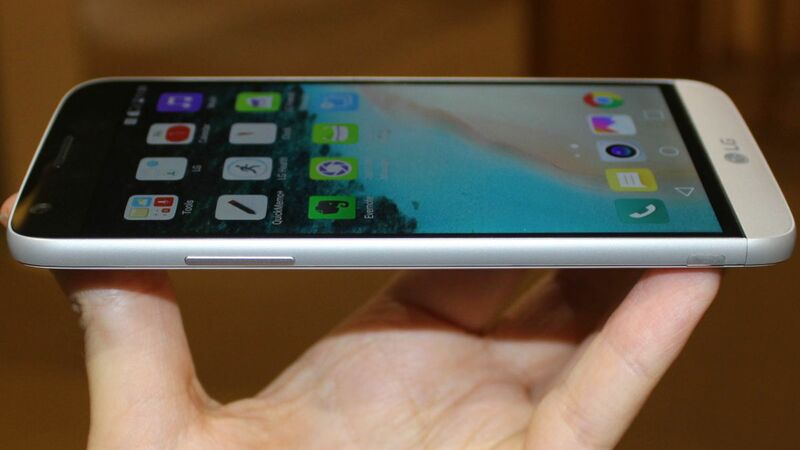 Having said that, the most recognizable of all is by positioning the power button and home button on the back of the phone to make it possible to reach single-handedly even with a 5.5-inch LCD this size on a G3 and most recently, G4. The Korean maker has continued their trademark of back power button plus an additional fingerprint detector function, but minus the volume rocker which had been shifted to the side to make way for a cleaner look. But the new flagship real standout feature is something else. LG has a new slide out modular design that lets you swap battery, attach a camera grip with physical control button and an audio module made in collaboration with Bang & Olufsen. All these without leaving out the highly favorable microSD and dual sim slot. The swappable part can be easily removed and pop back into the groove. Also, the battery can be snap out quickly by one simple tweak. Moving to the camera, two depth of field picture can be achieved in a form of a dual lens system. One with normal a portrait view 16MP shooter , another is an 8MP wide view shooter with a 135-degree angle to let you capture the whole scenery at the same standing position. Both lenses use optical and digital zoom technology to prevent stuttering sequence and let users feel seamless action when zooming in. For video bug, 4K video recording is also present. 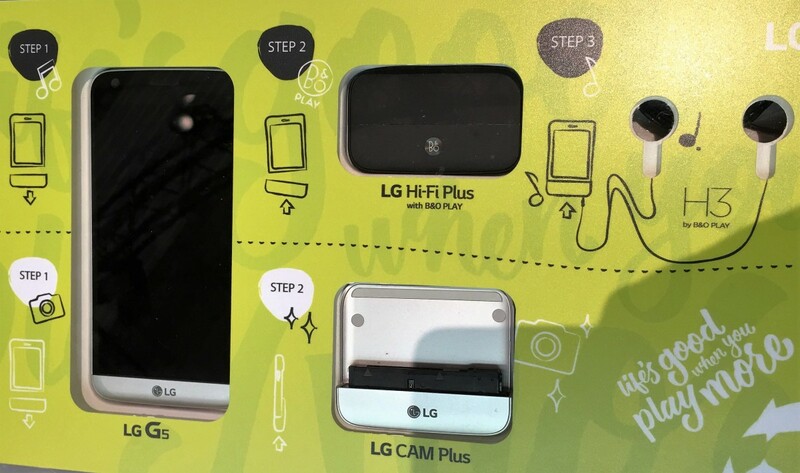 LG has been able to outsource much of its excess ambition to the Cam Plus and Hi-Fi Plus plug-in "Friends" for the G5. The Cam Plus module deliberately overriding the casing with a thicker frame which allows better grip and extra 1200mAh battery provide extra juice for the shutter button and zoom dial. Handling has never been much easier, allowing PRO camera experience to the users. LG has been facelifting its G series the past few year and decided to take a plunge by revamping the current successor into a more aesthetic look. 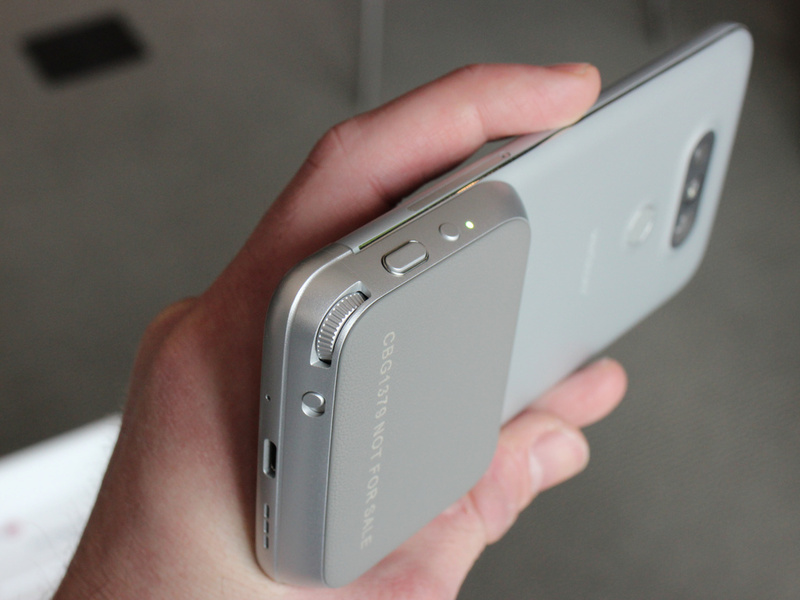 The new G5`s housing is fully made of aluminum alloy instead of plastic covered in metallic paintwork. It houses a smaller 5.3-inch Quad HD display which condenses into 554 PPI. The volume rocker is shifted to the right-hand side to address the user feedback of back volume control flaws especially when it`s lying flat on the table; you don't have to pick up the phone to change the volume. No more curve LCD and bulky size as consumers are accustomed to a more flat surface which is easier to hold and pocket size handset. 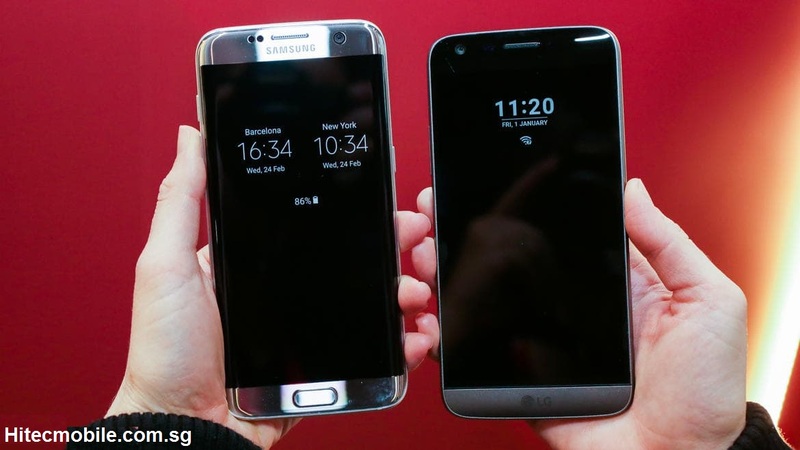 The new design does make the phone looks and feel similar to LG`s longtime arch-rival flagship; the S7 Edge. Fingerprint reader has been added to the back for more security but is less reachable than the S7 Edge`s front home button fingerprint sensor. 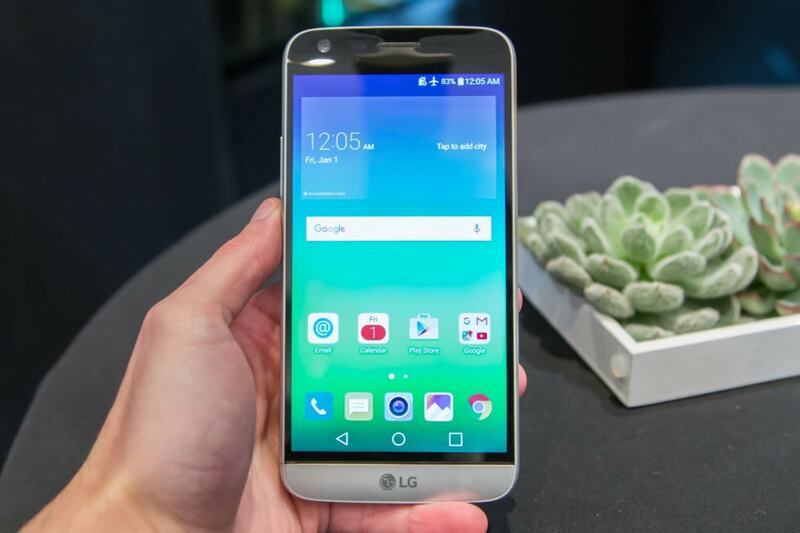 Instead of trying to overload the display with more pixels, the G5 settle for QHD IPS display. This resulted in minimum battery usage, and a higher pixel display makes no differences to a human eye. The 554ppi shows up even in bright daylight without having to increase the screen brightness. Function-wise, the LCD panel double-up as a notification billboard. Then always on display will show up only when the phone is in standby mode. 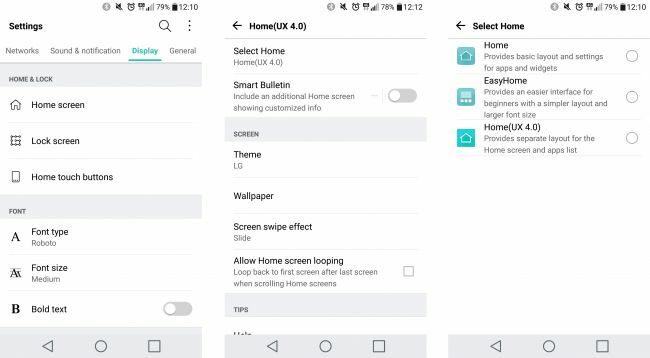 Although the second display is quite dim compared to Samsung`s own always on display, the G5 shows all your notifications including third-party apps to alert user of any missed info. This addon sets itself apart from S7 Edge which only shows missed calls and messages. 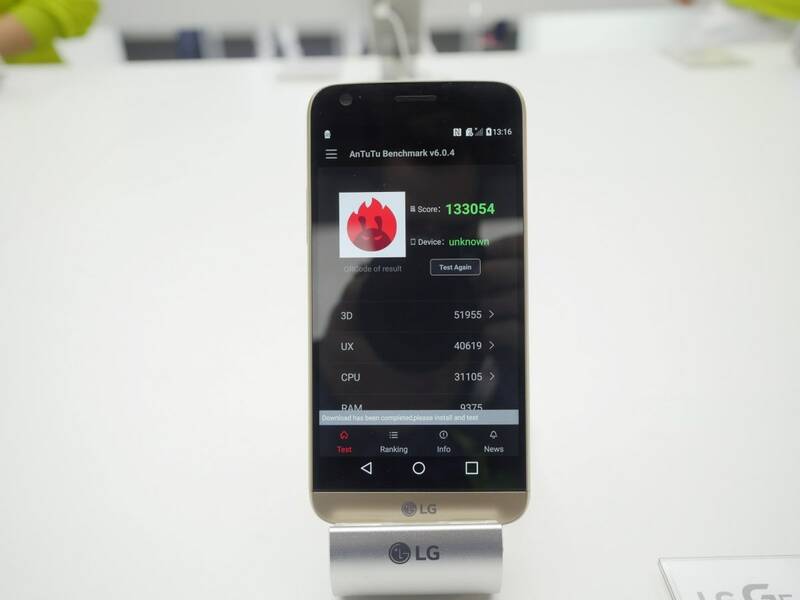 LG has built up a lot of anticipation for the G5, and it’s not hard to see why: It uses Qualcomm`s latest Snapdragon 820 processor along with 4GB RAM. The result? A powerful smartphone that is on par with Samsung S7`s Exynos 8890. The G5 will be running on Android Marshmallow 6.0 with its own customised UI on top. It`s worth mention that the onboard memory is 32GB. Although there will be an optional microSD slot up to 200TB expandable, the environment only allows apps to be running on the internal 32GB. Menus are kept clean and only Google and LG Smartworld are installed. 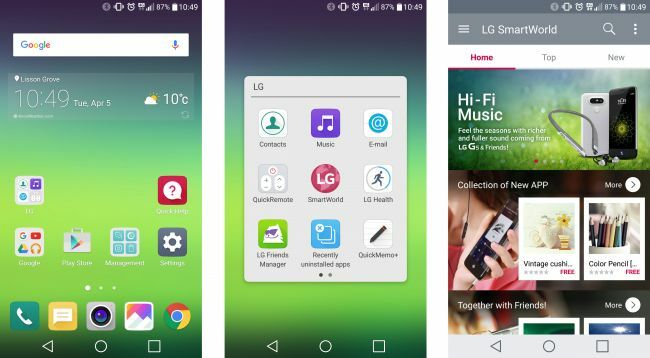 When LG removed the apps drawer from the home screen, the apps are fully occupied, and i need to scroll down many pages to find it. Folders help to keeps all related apps organized and less messy. 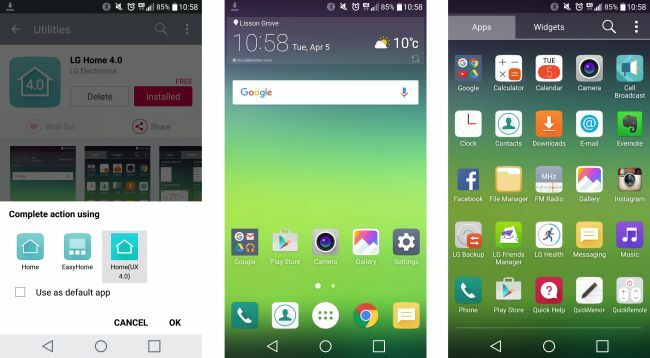 LG quickly reinstate the apps drawer interface before the phone release to pacify consumers who swear by the old version. The steps are simple; you just need to follow the instruction below. Step 2. 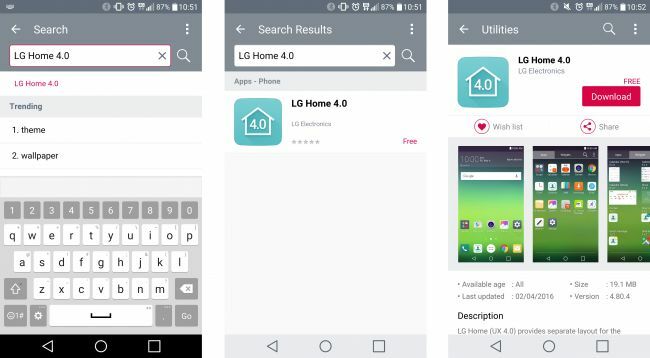 Search for 'LG Home 4.0' in the top-right corner of the app. Step 3. 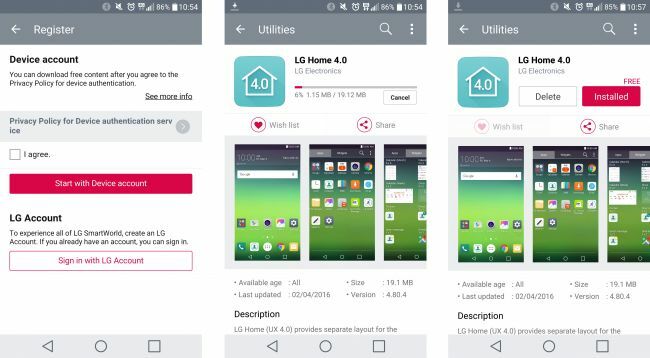 Download "LG Home 4.0" onto the G5. Once done it will automatically install. 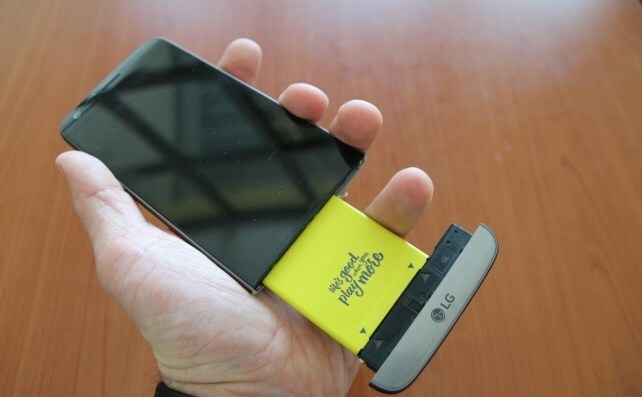 LG finest creation yet gives us a perspective of what to expect in a smartphone for the future. To say the G5 is a game changer of flagship device is an understatement. Instead of playing along with slim and high-performance handset, edge screen and unswappable battery like others smartphone makers in the field, the G5`s upgradable modular fixture keeps us excited for new "Friends" to join in the fun. third party vendors and vendors can now codeveloped apps and hardware that works with G5 and its current Cam Plus and Hi-Fi Plus modular. Beside the potential of add-on in the G5, it packs the finest software in Android Marshmallow 6.0 and hardware available today. Although the design layout is nothing to shout about as to compare to Samsung S7 Edge and Huawei Nexus 6P, its unique dual camera setup is another main attraction to potential consumer. 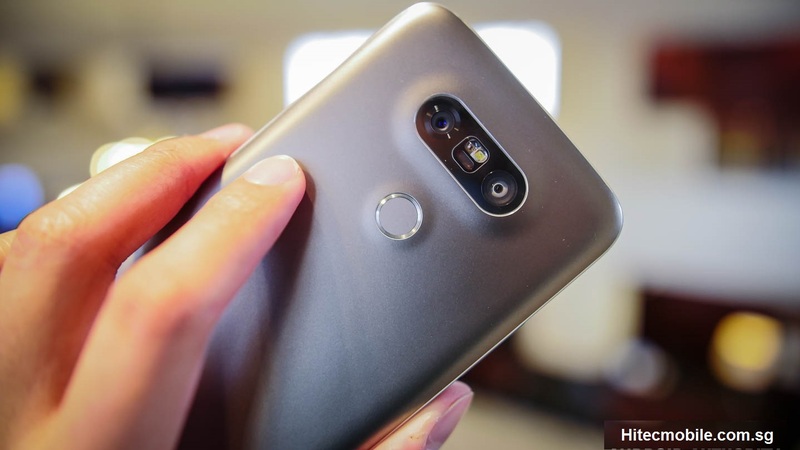 For those who enjoys customization and prefer something out of the box, the current LG G5 price in Singapore at S$830 will be an interesting upgrade to your current boring handset.